India has some of the best and most stunning waterfalls in the world, of which few are situated in Kerala. Each state has its very own show piece, making it vital to enlist the waterfalls in every state. You never know when you may plan a trip and having this information ready could prove handy. Goa not only has beaches to offer but also the Dudhsagar Waterfall, which is among the best waterfalls in India. The name of the falls translates in English to Sea of milk due to the transformation of the water colour from blue to white as it is crashes to the bottom. The falls are 60 KM from Panaji in the state capital of GOA. The fall is the 5th largest in India, measuring 310 meters. The best time to visit the falls is at the peak of the monsoon season when the river is at its highest flow. The fall splits into 4 tiers creating a truly awesome scene. What makes the Jog Waterfall spectacular is not its height but rather the width, having a girth of 290 and a high of 259 meters the falls are spectacular to experience. The waterfalls is located near Sagara in Karnataka and is a major tourist attraction of the region. The falls are also known by the names Gersoppa falls and Jogada Gundi by the local people. It is the second biggest waterfall in Asia making it a must see. Due to the large number of tourists, you can get the required provisions, snacks and food to consume while enjoying the beauty of the waterfalls. This is a unique waterfall not to be missed, as rather than one out flow, these falls have seven streams falling from the same source resulting in a truly wonderful water fall. The Nohsngithiang Waterfall is just 1 KM from Mawsmai village in the East Khasi Hill District or Meghalaya. The falls measure 315 meters and a girth of 70 meters making them the 4th biggest waterfall in India. The best times to visit the falls are during sun rise and sun set when the falls look more stunning. There are many places in the locality providing stay due to the high number of tourists visiting the region. The Thosegharh Waterfall is located within a deep gorge near the village Thoseghar which is approximately 20KM from Satara City on the edge of Konkan. There are several waterfalls, the shortest measuring 15 meters and the tallest 500 meters. Visitors come from all over Maharashtra making it a popular tourist destination. The best season to experience the waterfalls is during the monsoon when the falls flowi with immense fury. The surrounding area also offers quiet and peaceful setting making it ideal for relaxing and spending an afternoon close to nature as surrounding hills are thickly covered with forests. Also known as the Niagara of India, this a gorgeous and most beautiful waterfall located in Athirappilly Panchayath, eco friendly destination Kerala. The Chalakudy River feeds the Athirappilly Waterfall resulting in a spectacular showdown. It is a relatively small waterfall measuring just 24 meters but the width of the fall is what makes it an attraction not to be missed while . In addition to the waterfall the area also has an abundance of wildlife like the elusive and endangered great Hornbill, found in the forest around the waterfall. The falls are most scenic during the monsoon when the river is full, resulting in a great experience. The Courtallam Waterfall is located south of a small town Panchayat in Tamil Nadu. The falls measure 160 meters, making it one of the tallest in India. The waters flowing in the Chittar River originate from the Western Ghat thus resulting in a continuous flowing water fall which is fabulous to see in any season. The rainy season offers a larger waterfall and due to its height it is best to observe it from a distance to be able to see the whole fall. The waters falls in steps resulting in a truly stunning view. You can reach the falls with a jetty built right across the river below the falls. The Talakona Waterfall offers an impressive 270 foot fall before the water pools at the bottom . The falls are located in the Sri Vankateswara National Park in the Chittoor District of Andhra Pradesh. The waterfall is also famous as the Lord Siddheswara Swami Temple is situated very close to the it. The area around the waterfall offers an abundance of wild flowers and butterflies found nowhere else but here. The best season to visit the fall is during the rainy season when the river is swollen, resulting in a roaring demonstration of the power of the fall which can be heard from several KM away. The Khandadhar Waterfall is near Nandapani of Sundagarh District in the state of Orissa. The falls are the 12th highest in India. Bonaighar is approximately 19 KM from the falls and can easily be reached by vehicles during the dry season as the road leading to the falls is not paved. You could also easily hike down from a safe parking lot which is around 1.6 KM from the falls. The fall measures an incredible 244 meters resulting in its waters turning to mist before hitting the pools below. Best seen during the dry season due to the tricky paths leading to the fall, which could be slippery when wet. Measuring only 29 meters in height, this waterfall isn’t among the best in India due to its height but due to its breathtaking girth. During dry season, water flows from one of the lower exits in a steady stream but the water behind the falls have been dammed by a level rock, resulting in a spectacular showdown during the monsoons. The water rises and begins flowing from the whole rock face which measures close to 200 meters resulting in a truly awesome site. The Chitrakot Waterfall is located in Jagdalpur, Basta District Chhattisgarh and attracts tourists in thousands each year to watch this phenomenon unfold. These falls are unique in their own way as the water feeding the falls has eroded the limestone, resulting in deep crevasses through which the water flows during the dry season. In the rainy season it’s a different story as the flood water engulfs the whole area, resulting in a powerful force of nature. The falls are fed by the Narmada River in Bhedaghat, Madhya Pradesh. Both seasons offer a different beauty to the falls, but most tend to prefer the dry season as one can observe the beautiful crevasses the water has carved into the lime stone as well. The Kunchikal Falls are whopping 455 meters high and flow in steps,creating many smaller falls. The total length of all falls put together exceeds a kilometre making it the longest multiple fall series globally. The falls are also known as Kunchikal Abbe, close to Masthikatte-Hulikal of Shimoga District Karnataka. The Varahi River feeds the waterfall which flows near the famous Ghati Temple. The best season to visit the falls would be during the monsoon, when the water flow is at its height. The area surrounding the falls also offer fantastic views . These falls are situated in deeper area within Simlipal National Park in the Orissa District of Mayurbhani and is one of the tallest waterfalls in India. The Barehipani Falls measure a staggering 399 meters, just a meter shy of 400. The fall bifurcates in two, the taller one being 259 meters. The surrounding area is covered with lush green forest and while on the way there you can spott the local wildlife and bird’s, native to the region. During the night if you’re lucky you may spot leopards on prowl as well. The Langshiang Falls measure 340 meters and comprise of a series of waterfalls, making up one long and gorgeous fall. The fall is near Sangriang Village which is 24 KM from Nongstroin in the Western Khasi District of Maghalaya. The falls can be seen from the village but only a closer view will reveal the real beauty these falls hold. This is the 3rdlargest waterfall in India. The falls are located on the Nangkhunaum river island and one will have to travel by boat to reach the falls. Make sure to carry food, drink and snacks as you may not find vendors at the fall. The Nohkalikai Falls is the largest and most beautiful waterfall in India, measuring a whopping 335 meter and is located in Cherrapunji, which is also one of the wettest places on earth. The constant rain feeds the rivers flowing which finally ends as the falls. The fall is located in Shillong and unlike other waterfalls requiring you to visit during a particular season, Nohkalikai flows the year round and you can enjoy the best display anytime. While visiting it is advisable to carry a raincoat, as here it rains without warning. 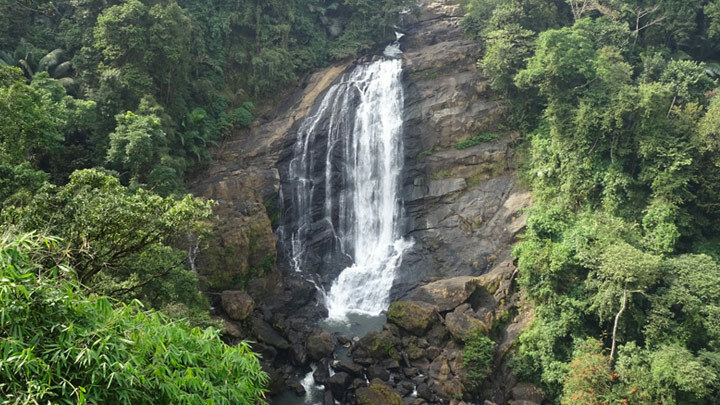 These majestic falls are located 29 KM from the small town of Kalpetta in the Wayanad District, Kerala. The water fall splits into three and stretches an impressive 300 meters and is the largest waterfall in Kerala. To get to the falls you must hike 2KM, so people with walking problems might not like to venture here. For the young and adventurous ones this is the place to visit and enjoy a weekend afternoon. You must carry food and drinks as no vendors are available. The falls are best during the monsoons when the river is flooded. The Falls are located in Lonavia, Pune district Maharashtra and is the 14th largest waterfall in India. The Kune Falls measure 100 meters and splits into three before gushing into the valley below. The area is surrounded by forest making it a perfect picnic spot. The local council has set up a clean park overlooking the waterfall, where you could enjoy your weekend afternoon. There is an abundance of public transport during the weekends when people from Pune visit to enjoy the weekend with their families. There is a trek leading to the falls which you can opt for but be prepared to get your feet muddy as it is not well used! The falls are situated in a forested area where the water falls from a height of impressive 297 meter, this fall also bifurcates into two. It is located on the Palani hill in the Dindigul District of Tamil Nadu. The falls are best seen from the adjourning view point, where you can see the whole fall including the smaller one at the top of the gorge. To get to the waterfall you must trek one kilometre . You will have to descend downhill the whole way but the real test comes while climbing back out, so think it over before venturing to the bottom of the falls! This is a trifurcated waterfall, located in Mizo village 5 KM from Thenawi, Serchhip District Mizoram. The Vantawng Falls is 30 km from Serchhip and is the 13th largest waterfall in India. The falls are located in a lush green forest which remains partly green due to river’s constant supply of water. There are several standpoints from where you could see the falls from a distance and venturing closer should only be done during the dry season as climbing up the steep cliff while getting in and out causes complications. There are great picnic spots around where you can enjoy light meals while watching the falls. As the name suggests, the falls resemble an umbrella, mainly during the monsoon when the Pravara River gets flooded . This fall is located at Ghandardara. Anmednagar Maharashtra. The falls are only 45 meters high but the volume of water flowing through the wide water fall is immense. There are jetty available for people to cross the river at the fall’s end which is a must try. Although its seems pretty scary but the experience of crossing through the river is something that is sure to have a lasting effect on your mind though out your life. This fall may not have a majestic height like many other falls in India, but the unique formation is what places it among the best in India. The Hogenakkal Waterfall is located in south India in the Dharmapuri district of Tamil Nadu. It is located 180km from Bangalore and you might feel the need to plan a night or two stay at the Dharmapuri to really enjoy the setting. The river has eroded the softer rocks making the water fall circle and then finally drop into a crevasse before flowing away. This is a major tourist destination and you can find many stalls and vendors selling food, snacks and drinks. Abbay falls , situated in Kodadu, Karnataka, in the small town, Madikeri. The waterfalls are on a coffee plantation and are best seen during the monsoon season when the river is in full flow. Only 6 km from Madikeri the river offer s a perfect picnic spot where you could visit and enjoy lunch, with the mist from the waterfall offering relief from the hot sun. It is a team outings destination and perfect getaway on the weekend for you and your family. The water of the falls later flow into the Cauvery River before spewing in the sea. Kiliyur Waterfalls are located on the Eastern Ghats at the Shervaroyan hill range or Tamil Nadu. The falls offer a 300 ft drop resulting in a spectacular showdown. Getting to the falls require hiking downhill for approximately 15 minutes , but the effort is surely worth it. During the dry season the falls are small with just a little water trickling down but during the monsoon the falls are at the peak of their fury. Plan your trip during the monsoon as it will ensure a fantastic view. The Papanasam fall in the Tinunelveli district of Tamil Nadu India, around 60 KM from Tinrunelveli, are worthwhile to visit due to its awesome view and falls. It is a popular tourist attraction seeing people come from all around Tamil Nadu to the place. The falls offer a 120 Meter drop, one among the highest falls in Tamil Nadu making it not to be missed. If you love spending time close to nature then it is the right spot for you. Due to its popularity, it is possible to find vendors selling snacks near the falls, but make sure to keep the place clean! The right time to visit the Shivasamudram Falls is during the monsoon season, as the river is at its highest level then, which would make youlove the falls. The falls are located in Karnataka’s Mandya district near Bangalore. The Kaveri River feeds the falls and is located on the boundary of the Chamarajinagar District of Karnataka. Although the falls only offer a 98 meter drop, they have an impressive girth of over 300 meters making them a spectacle to watch. During the dry season the falls lack the required water so make sure to visit during the monsoon when the falls offer an impressive scene. The biggest attraction of the Soochippara Falls is the easy approach to the falls during the dry season, which makes it possible to bath and enjoy the cold waters especially during the shimmering summer season. The falls are also known as Seninel Rock Waterfalls. The area is surrounded by lush greenery, making it an ideal getaway. The falls descend an impressive 200 meter, resulting in a misty bottom. This is what attracts the people visiting the falls as you need not worry regarding the dangers other waterfalls usually possess. These falls are located very close to the Bhagsu Village which has the famous Bhagsu Temple, harbouring the beginning of a fresh water stream. The Bhagsu Waterfall is a 20 minutes walk from the temple. It is a famous pilgrim spot in McLeod Ganj and while visiting the temple it is worth to make the hike down to the falls. Due to the high number of tourists visiting the location you can get all the required provisions, snacks and drink at the village rather than carrying the extra weight. There are also restaurants and guest houses if you wish to spend a day or two at the place. The Amritdhara Waterfalls are located in Kariya District Chhattisgarh. The area is covered by dense forests, mountains and rivers. This makes it the right setting to result in a spectacular waterfall. This waterfall is great to see in any season with water flowing from the far reaches of central India, but during the monsoon the fall is full of water resulting in the true show of fury! The falls are also close to the Shiva temple where the Mahashivaratri fair originated in 1936 and continues till date. At the fair you can pick up some awesome handicraft as memento too. The Barachukki falls are located a few kilometres from the Gaganachukki falls making is a double treat for the nature lovers as you could visit both the falls on the same day or trip. These falls are located amid the rocks, resulting in jagged rocks lining the waterfalls. There are many signs and warnings for people to warn them against attempting to go close to the falls. These two falls are among the most visited ones in Mandya District Karnataka, as it allows one to see two falls at the same time making the trip to the falls truly worthwhile.It is a best day outing destinationaround Bangalore for corporates and families. 29. Bear Shola Falls – where bears come to drink! The name of the falls means ‘where bears come to drink water’ and are located in Kodaikanal Tamil Nadu. The Bear Shola Falls are located 1.5 KM from the Kodaikanal bus stand and 2 Km from a wonderful lake. This makes the area a wonderful picnic spot where you could visit and see two water bodies, delivering the required relaxation a person needs on a weekend. If you’re planning to spend some more time here, you can easily stay at the Clifton hotels located on a small hill near the fall. Plan your trip during the monsoons to get the best experience of the falls. Many have heard about Darjeeling’s tea plantations, but many tourists who visit Darjeeling miss out visiting Chunnu Summer falls which are situated just a few kilometres from Darjeeling town and offer a perfect getaway. While visiting the hill station you could visit the falls, which offer a perfect setting for a family picnic. There is also a rock garden and a small lake in the same vicinity which could be visited to enjoy a boat ride. Coupled together these activities will help keep the family or person entertained the whole day making it a perfect place to visit. The area also offers great hiking trails to the famous Darjeeling tea estates on hills of Sikkim. The famous Elephant Falls have been depicted in many paintings due to their stunning appearance the falls deliver. They are located 12km from Shillong, in the far northern part of India. They resemble Scotland and is predominated with misty and foggy weather. Make sure to carry warm clothing while visiting. There are three falls which could be approached individually using small trails. You need to descend around 100 meters each time to get to the prime spots to view the falls. They tend to also be rough during the rainy season so be prepared to get wet and muddy! The falls comprise of a 70 foot fall on the river Chandravenka of Andhra Pradesh. While visiting the Ethipothala Waterfalls it is also suggested to visit the crocodile breeding centre at Lagoon near the falls. The falls are 11KM from Nagarjuna Sagar, which makes it accessible even by public transport. Due to large number of tourists in the area there is an abundance of stalls offering snacks. The falls may be small but owning to the beauty of the location many people prefer visiting the area for relaxation or simply a weekend picnic. The Ghatarani Waterfalls are located 25 km from the Jatmai which is a small town in near Bhilai, Chhattisgarh. This is on the south-eastern highland or Chhattisgarh which is around 85 km from Raiput. It is the biggest waterfall in Chhattisgarh and is best visited between September to December. Unlike many other waterfalls in India, this one should be avoided during the monsoon due the rough and dangerous levels of the fast flowing waters. The falls are surrounded by lush greenery which makes it a perfect location to have a family picnic on the weekend offering the family a different screen from the usual. The Hanuman Gundi Falls, also known as the Suthanabbe falls, are located in the hilly areas of the Kadremukh National Park. The national park is located in Chikkamagaluru District Karnataka, India. This is a wonderful 22 meter waterfall that can be best seen during the monsoon season. The waterfall coupled with the scenic surrounding results in a perfect setting for picnics and weekend excursions for people visiting or living in the area. You could also visit the Lakya and Karkala Dams, which are close by to the water falls. This is a gorgeous 1500 foot waterfall in the heart of Chhattisgarh, and is between the Dongargarh and Gondia railway stations, making it very accessible by public transport. What makes the Hazra Falls a perfect place to visit on the weekend, are the lush green sounding and the close proximity to the railway station. The falls are best seen during the peak of rainy season, when they are overflowing with the waters from the surrounding hills. Snacks and food should be carried along as only a few vendors are found near the falls. The beauty of the Iruppu Falls is the height at which the water falls and not the sheer drop. Unlike many other waterfalls, the Iruppu doesn’t fall once, but in a series of falls resulting in an elongated waterfall stretching 300 ft. The fall’s height is only 130 feet but it beautifully flows down the continuous steps, making them one of the most spectacular waterfalls in India. It is located in Brahmagiri Range in Kadago district of Karnataka near the Kerala border making it accessible even from there resulting in a large number of visitors on the weekends. The Karumalai Falls is located in Tamil Nadu, Valparai district and is in the interiors of animal Tiger Reserve. The area is also surrounded by tea plantations and thick forest making it a perfect setting for a waterfall. The area is isolated and you would need to carry your snacks and drinks. The waterfall is best viewed from a distance as the terrain leading to the falls is rough, and from a distance, the waterfalls also deliver a much more admirable screen than what you would experience while being closer to the falls. Is is a perfect setting for a family weekend getaway so make sure you visit these falls while in the region. Kempty Falls are located 15 km from Masoorie, a popular hill station inUttarakhand as much are best hills fortreks in Ladakh . It is approximately 30 KM from Dehradun, the capital city of Uttarakhand. The name originates from Camp Tea which was a favorite spot for colonial officers to organize tea parties on weekends. The falls are well connected by public transport due to the large number of people visiting the falls. The falls descend an astonishing 4500 feet in series, placing it among the longest waterfalls in India. If you like fishing then this is the right place, as there are loads of trout in the river. This is a waterfall that is unlike any other found in India or around the world, as the screen resembles a flight of stairs when the water gushes down. This leads to a spectacular screen unlike others as you would expect. It is located in Chakai, Uttar Pradesh and has a height of 65 meters. The best time to experience the Rajdari Waterfalls would be between September and March or during the autumn and spring. This is due to the winter and summer in the region being harsh and you wouldn’t be able to enjoy spending time close to the falls due to the heat and cold of summer and winter. Located just 5Km from Kigga, near Sriheri on the Western Ghats or Karnataka, the waterfall makes an ideal weekend getaway for residents in the area. The Srimane Falls is small comparatively to other waterfalls in India, but the beauty and location does place it among the best . The best time to visit the falls is during or immediately after the monsoon, when the river is flooded with waters from the upper reaches on the Ghat, resulting in a fabulous setting for a perfect getaway. It is vital to make sure that you add visiting these falls to your trip while visiting the area. This waterfall is located near Thodupuzha in Kerala and is named after Mr Thommachen Kuruvinkunnel, a great hunter of the region in the early 1900s. He was the one who found the Thommankuth Waterfalls which comprise of seven steps before the water gushes into a pool below. The area is covered with lush greenery and exotic flora and fauna. While visiting the falls, you may be able to spot wild animals so make sure to keep your eyes glued to identify the one in the vicinity. The falls are not big, but deliver the required screening for a perfect weekend picnic. This is a gorgeous waterfall situated 5 km from Thenzawl. It is in the Sachhip district of Mizoram. The Vantawng Khawhthla waterfalls comprise of two steps and have a height of approximately 100 feet, making it a spectacle must see. Due to its immense height this fall is best seen from a distance as you can see the whole waterfall as it drops. The local authorities have set up the required view point where you can enjoy you afternoon while watching the falls. The falls are surrounded by lush green forests making it a perfect setting, away from the noise and hassles of daily life. The Barkana Falls is among the ten largest waterfalls in India, measuring a staggering 850 feet. It is located in the state of Karnataka, in the town Agumbe, Shimoga district. The river feeding the falls is the Sita River which has been dammed for hydroelectric power in Karnataka. The falls are accessible by road and public transport is available. There are many vendors prowling the view point selling different snacks and food. It’s best seen during the monsoon, but as the area encounters leeches during the rainy season, you may be better off visiting during the dry season to avoid these blood sucking parasites. The Muchkund River in Orissa feeds the wonderful Duduma Falls, which are 157 meter high making them one of the biggest and most wonderful waterfall to visit in India. Duduma is located 95 km from Koraput and approximately 200 km from Visakhapatnam, making it vital to consider staying the night if you come to see the falls. This would give you adequate time to spend around the falls and also give rest after the long journey. The falls are best visited during the monsoon season when the river is full and delivers the awesome power of nature. The Lodh Falls,also known as Burhaghaugh falls ,are located in the Palamu Division of Latehar District Jharkhand. This is the tallest waterfall in Jharkhand and is ranked 21st tallest in India. The falls are located on the Burha River within the Chota Nagpur Plateau forests. The falls measure a whopping 143 meters and make a thundering sound that could be heard from over 10 KM away. This is a reason enough to visit the falls during the peak of monsoon. Due to its deep location you must have private transportation or hire the vehicle to visit the falls. They are best seen during the rainy season.